Forman Christian (FC) College Lahore admissions are announced officially and duly filled admission forms are invited from applicants who fulfill requirements for admission in various graduate and undergraduate programs programs like FA, FSc, ICS, ICom, BA, BSc, BS (Hons), BBA (Hons), MBA, MBA Executive, MA, MSc, MS, Mphil and PhD in different academic disciplines. FC College Lahore was a vision of a USA missionary Dr. Charles Forman and this vision turned into reality in 1864. The oldest name of Forman Christian College was Lahore Mission College. In 2004 FCC Lahore was given the status of a university by HEC and allowed to introduce degree programs in various disciplines. FCC University Lahore admissions are awarded purely on merit base and talented students are welcomed to apply into various degree programs. Don’t miss out to check the FCCU Lahore admission procedure, steps to download admission form, updated FC fee structure, eligibility criteria and requirements for admission, schedule of entry test, FC college merit list, scholarships and job openings in the proceeding paragraphs. Forman Christian College Lahore Admissions are launched for the current session through publishing the advertisement in famous newspapers. Various degree programs mentioned in the admission advertisement are FA, FSc, ICS, ICom, BA (Hons), BSc, BS (Hons), BBA (Hons), MBA, MBA Executive, MA, MSc, MS, Mphil, and PhD. Some study programs at Forman Christian College University are offered on annual basis and others are semester based. FCC Lahore proposes admissions for degree programs two times in a year termed as spring and fall semesters. FC College University is one of the best institutions not only in Pakistan but also in the sub-continent, so every student strives to be a part of the institute. If you are interested to get admission at in it then here you can find all material related to entrance in FC College i.e. steps to download admission form, list of degree programs offered by Forman Christian College, admission ad 2018, eligibility criteria and requirements, FC College entry test enrollment, preparation of merit list, FC College address and contact number etc. Looking for Lahore’s best universities for admission? Must check these top ranked institutes before its too late. UET Admission, UCP Admissions, UMT Admission and UOL Lahore Admission. In order to get admission in FA, FSc, ICS, I.Com, undergraduate, masters or postgraduate degree program then you must apply online by Clicking Here. You can apply online for admission into various study programs at FC College University Lahore. Further instruction to fill the entry form is given on each step. Follow this instruction to correctly fill and submit it. Baccalaureate admissions in FC are opened in March. All interested candidates must keep in touch with our website to know about the latest enrollment opening at FC College Lahore. The last date to apply for admission in various study programs is different for different programs. 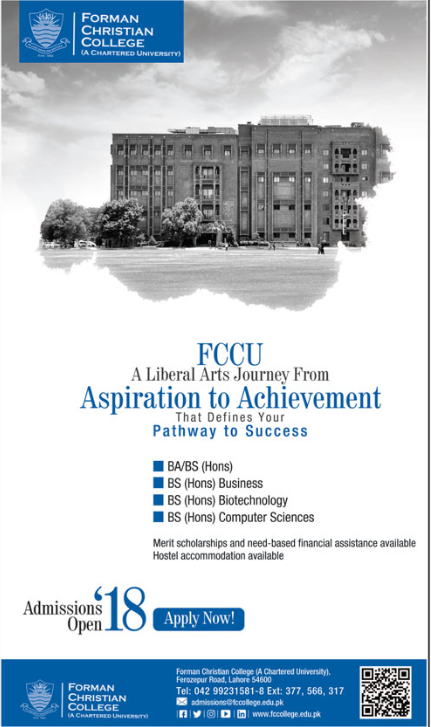 Forman Christian College Lahore advertised their offered academic courses as admission advertisement in many newspapers. For spring semester in the month of March and for fall admissions are announced in the month of July. Eligibility criteria and last date to submit the admission form is also visible on the admission advertisement which is given as under for your easiness. FC College administration reserves the right to revise the fee structure at any stage without prior intimation to the students. Fee structure of various study programs at FC College Lahore is completely described in the prospectus. Fee structure of various degree program can be seen by clicking Here. To apply for admission into various study programs at FC College Lahore, you must follow the following steps to get admission at FC College University Lahore. All information should be typed in the capital letters. Mandatory fields are not left empty, otherwise, the form will not be submitted. After providing all information in the admission form, click submit button to submit the form online. You must save tracking ID of the submitted form and then take a printout of the admission form. Print the processing fee voucher and pay it in the designated bank branches mentioned on the fee voucher. Printout of the admission form, 3 passport size color photographs along with attested photocopies of all academic certificates must reach admission office of Forman Christian before or on the Last date. For admission into Fa, FSc, ICS, ICom, those students who have passed their matriculation or equivalent examination with 1st division are eligible to apply. Result awaiting students can also apply on their 9th result card. Eligibility criteria and requirements to obtain admission in undergraduate level degree programs applicant must have acquired 45% marks at least in FA/FSc or equivalent degree to be eligible for admission. For enrollment into masters level programs, candidates must qualify 14-years education with the minimum 2nd division. For getting entry into post-graduate level degree programs candidate must pass 16-year education with minimum 2.5 CGPA. FC College entry test is mandatory to get admission at FC College Lahore into any program of study. GAT Test is compulsory to qualify for enrollment into a postgraduate level degree program and doctorate level degree programs. FC College has launched the following intermediate, undergraduate, masters and postgraduate degree programs for obtaining admission. FC College Lahore offers the FA, FSc, ICS, ICom intermediate programs for students. BA(Hons), BS (Hons) in with major in physics, chemistry, environmental sciences, economics, statistics, political sc, history, mass communication, pak studies, English, BSCS, BBA (Hons), BS Biotechnology. MA, MSc in a different discipline like computer sc, economics, statistics, history, pak studies, psychology, Mphil in biotechnology, food sciences, chemistry, physics, political science, applied economics. Ph.D. in Biotechnology, physics, and chemistry is currently going on at Forman Christian College University Lahore. The institute prepares the merit list of eligible candidates after the detailed scrutiny of their academic record and other documents provided by the candidates. University displays the merit list of those candidates who are offered admission in various degree programs. FC College prepares a separate Merit list of different degree programs. After the display of first merit list, candidates are advised to pay the fee dues by the last date whose names appear in the merit list. comprehensive details about various types of scholarships offered by FC College Lahore. FC College encourages both male and female candidates to apply for the vacant posts which are advertised by the official administration. Suitable candidates are selected by going through the merit-based selection process. Experienced candidates are given preference required to teach the graduate and post-graduate classes. The latest job opening at FC College Lahore can be seen by clicking Here.